Passengers from around the world regularly post reviews of their experiences in ports on Cruise Critic – which is widely recognised as the leading cruise review site. Then, every year, the ports which received the highest number of glittering reviews are outlined in the Cruisers’ Choice Awards – with the top five ports in each region receiving recognition. Regions include Alaska, Asia & South Pacific, Eastern Mediterranean, European Rivers, Southern Caribbean and US & Canada. The British Isles & Western Europe category contains destinations from around the UK and westernmost European nations such as France, Belgium, Netherlands, Spain and Portugal. Sitting alongside the likes of Amsterdam and Lisbon in the 2017 Cruiser’s Choice destinations is the Scottish port of Greenock – which was awarded as the fifth most popular port in the region. Over the past 12 months, lines including Princess Cruises, Celebrity Cruises, Crystal Cruises and Disney Cruise Lines have all had ships docked in Greenock – with passengers enjoying a wonderful during their visit. The Scottish port provides an ideal point of access to the iconic city of Glasgow and an array of scenic delights – all of which can be enjoyed prior to or after embarking on a cruise. If you are seeking somewhere to soak in the surrounding scenery, one of the best places to visit is Craig’s Top – which can be found at the summit of Lyle Hill. This, however, is just one of the many spectacular walks that one can enjoy during a visit to the area. Glasgow, which is located nearby, is home to the second-largest city in Scotland and is home to a population of 600,000. It is home to a range of interesting architectural and natural landmarks including the Gothic-style Glasgow Cathedral, a range of interesting museums and galleries, and the beautiful Botanic Gardens – where you will find a range of tropical plants from around the world. Throughout the remainder of the year, Cruise and Maritime Voyages will be operating a series of itineraries out of Greenock – with opportunities to explore the hidden gems of the United Kingdom. The luxury lines will also be operating itineraries out of the port on board their elegant ships. 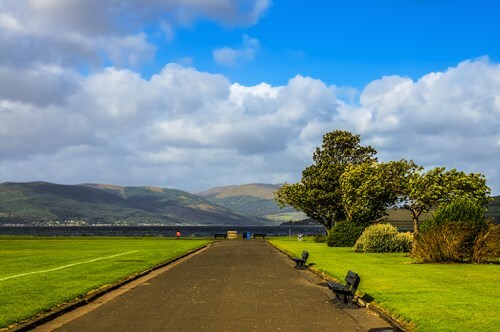 Greenock is just one of 18 cruise ports within the UK and Ireland where you can embark on a cruise. With more and more lines operating vessels from UK ports, cruising has never been more appealing than it is now. If this blog has inspired you to embark on a cruise, why not get in touch and let us build the perfect holiday package to suit your needs and desires. Contact us via the freephone number above or complete the online enquiry form.